Manufacturers of medical equipment ensure that all safety regulations during the design and manufacture are complied with and a safe equipment has been produced. Now it is the task of the hospital (hospital workshop) to ensure that the equipment remains safe during usage. In the developed world electrical safety tests are compulsory after every repair of a medical equipment and are furthermore, part of the preventive maintenance procedure. National and international organisations like ANSI, BSI, EEC, IEC, ISO, NETA, NFPA have defined safety standards and test procedures. 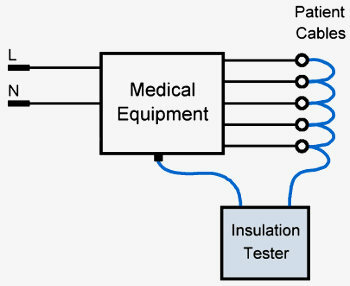 For medical equipment IEC 62353 is the most widely applied testing standard. In developing countries the above mentioned safety standards are hardly applied. There are different reasons for this: Monitoring organisations do not exist, the hospital management is not aware of the importance of safety tests, the technical department has no time or money to implement safety tests, and the technicians do not know how to perform the tests or they point out that the needed special measurement equipment is not available. Since safety tests for medical equipment are often time-consuming all hospital workshops in the developed world have automated electrical safety tester (safety analyser). These tester are multiple function tester and they carry out all tests automatically, no settings and connections have to be changed. The test results are printed out afterwards. The technician does not even have to know how the tests are performed or what the value limits are. This is very handy and time-saving. But these analyser are also expensive and thus almost non-existent in hospital workshops in developing countries. But the different tests can still be carried out manually - even without special measurement equipment. We only have to know what tests should be done, how they are carried out and how high the limit values are allowed to be. And for measuring we only need a common digital multimeter. 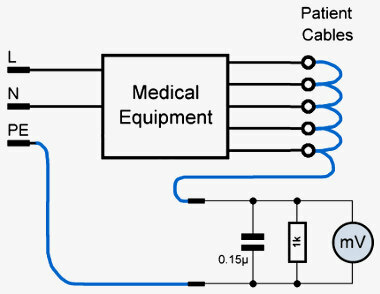 For medical equipment this classification is not sufficient enough because a medical equipment of the same class can be made for the usage without a connection to a patient, with a connection to the patient's skin or for a connection to the opened body of a patient. These different degrees are expressed by the appliance type. 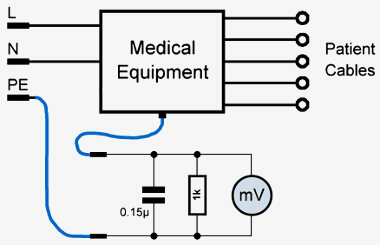 Medical equipment should be additionally protected by two internal fuses, one for the line path and one for neutral. In many countries L and N are not defined and the power plug can be inserted into the wall socket in both ways. Then the neutral fuse which is theoretically useless becomes the important line fuse. Also, smaller fuses inside the equipment blow faster than a MCB which is made for higher currents. The use of an isolation transformer is not specified in an extra safety class but it is a another possibility of protection. The isolation transformer is a 1:1 transformer which provides a galvanic isolation from line potential to earth. 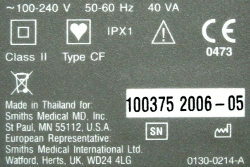 The output voltage is only present between the two output connectors and no longer from one (line) to ground. 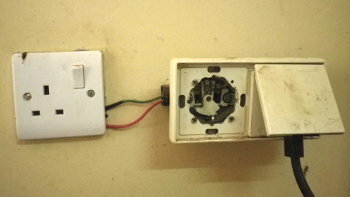 The output socket has no PE connection and may only be used for one equipment. 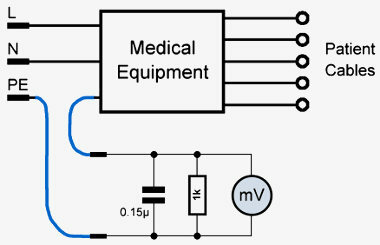 A medical equipment of one class can be used without a connection to a human body (e.g. suction pump), with a patient connection (e.g. pulse oximeter) and inside the body of a patient (e.g. electrosurgery unit). That is why the appliance classes are again divided in different types. The types define the degree of protection. Most of the wall sockets in hospitals in developing countries today are occupied by mobile phone chargers of the hospital staff. This is particularly bad when therefore hospital equipment is disconnected. Even when some equipment are not in use at the moment they might need mains in order to charge internal batteries. Discuss with the hospital management a ban for mobile phone chargers in hospital departments. But on the other hand also provide charging possibilities (distribution sockets) in e.g. nurses' rooms.